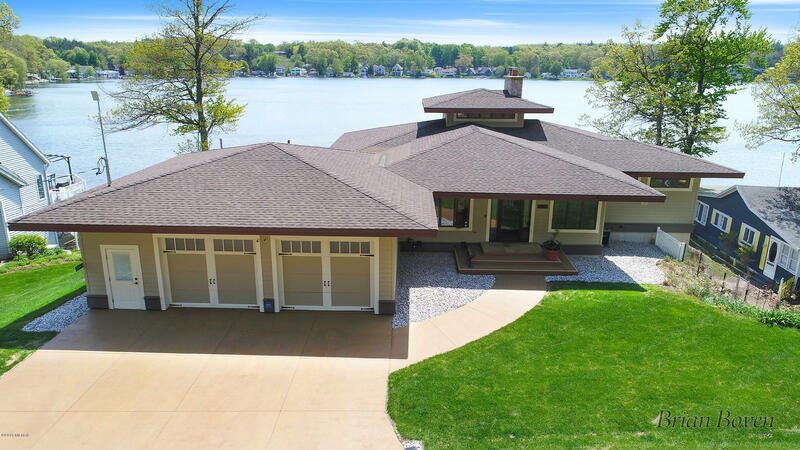 Custom Built, Frank Lloyd Wright inspired Prairie Home on the shores of beautiful Brower Lake in Rockford. There is TOO MUCH to list. Open style floor plan on the main level with breathtaking views of the lake from nearly every room. Large kitchen island with butcher block top. All cabinets are craftsman period, solid quarter-sawn oak. Large clerestory over the living room provides additional natural light with power windows. Master bedroom features Anderson french doors leading out to the deckwith incredible relaxing space. Master bath with tiled soaker tub and walk in shower. Lower walkout offers high end custom bar with 10 ft ceilings and second full custom kitchen! 2 additional bedrooms/office. Private bathroom. Must see one of a kind property that has been meticulously cared for! Just minutes from downtown Rockford. A Large multipurpose building may also be available for sale, for storage of lake toys, vehicles, tools, along with a huge woodshop. lakeside views. Master bath with double vanity, tiled soaker tub and walk-in shower. Fully finished lower level walk-out with plenty of storage. 10 foot ceilings! Full bath in lower level with a bedroom and an office which doubles as an additional bedroom. Family room area is next to a Huge 23' custom built bar with mahogany top, full kitchen, stainless steel appliances, wine cooler, kegerator (w/ 2 taps) and stainless steel counter tops. The bar seats 10 people. Walk out to the patio on the lakeside which is completely unobstructed due to massive "I" beams supporting the deck above. Solid oak trim throughout the home along with 3 panel, craftsman solid oak doors throughout . Large 2.5 stall attached garage with professionally installed epoxy floor. Enjoy life on the lake in the absolutely incredible custom-built home. Award winning schools. Just minutes from beautiful downtown Rockford and a short drive to Grand Rapids. You'll never see another one like this again. A Large multipurpose building may also be available for sale, for storage of lake toys, vehicles, tools, along with a huge woodshop.